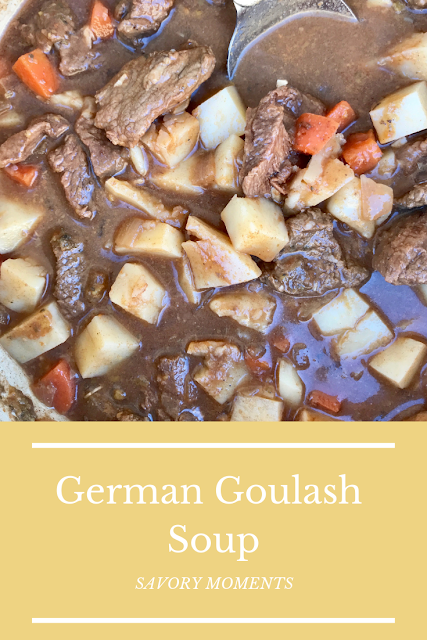 German goulash soup (Gulaschsuppe) is a hearty and warming stick-to-your-ribs meal for a winter day. It's National Soup Swap Day and I am sharing a soup recipe in celebration along with a bunch of other bloggers! I love making soup and eating it. 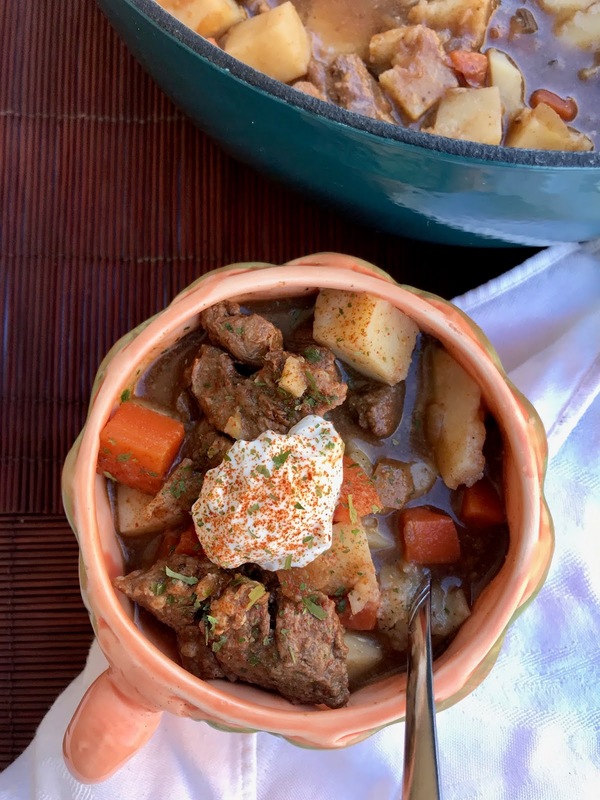 It's so versatile, it's often very budget-friendly, and it warms you up when the colder weather strikes (though I also eat soups in the warm weather). I've had this Gulaschsuppe marked in my copy of The German Cookbook for a few years now. It's supposed to be a favorite midnight snack in beer halls, according to the book. I don't know why it took me so long to make it -- it's a simple soup that is full of flavor! It's best made the day before eating, but you can serve it right away, too. I read a bunch of recipes online as well and some were pretty bare bones - just the beef, potatoes, and onion with water and seasonings. Others had vegetables like carrots and bell peppers and used broth. I went with a combination of recipes and made it as listed below. It was a hit with my husband and I - a nice weekend dinner on a cold January evening. This recipe will serve about 5-6 people as a main dish. Serve with crusty bread for sopping up all the super flavorful broth. Don't forget to check out all the other soup recipes below! In a large soup pot, heat the olive oil over medium heat. Add the beef, onion, and carrot and cook, stirring occasionally, until the meat is browned and the onion is translucent. Stir in the garlic, tomato paste, and paprika and cook for another minute. Stir in a good pinch of salt, a few grinds of black pepper, and the vinegar. Then add the caraway and marjoram along with the broth. Let the mixture come to a boil, stirring occasionally. Reduce to a simmer, cover, and cook for 45 minutes. Add the potatoes and continue to simmer until they are tender, about 15 minutes. Check for seasoning. At the point you can serve, topped with sour cream, if desired. Or, let cool and refrigerate, then reheat the next day to serve. One of my favourites, esp. in cold winter time. I am adding this to my list of soups to make....so good! That's awesome, Karen!! I'd love to do that someday! Those beef chunks look so tender! What a neat sounding cookbook. I love exploring international recipes. This looks delicious. I love trying German recipes because both my family and my husband's are of German decent. 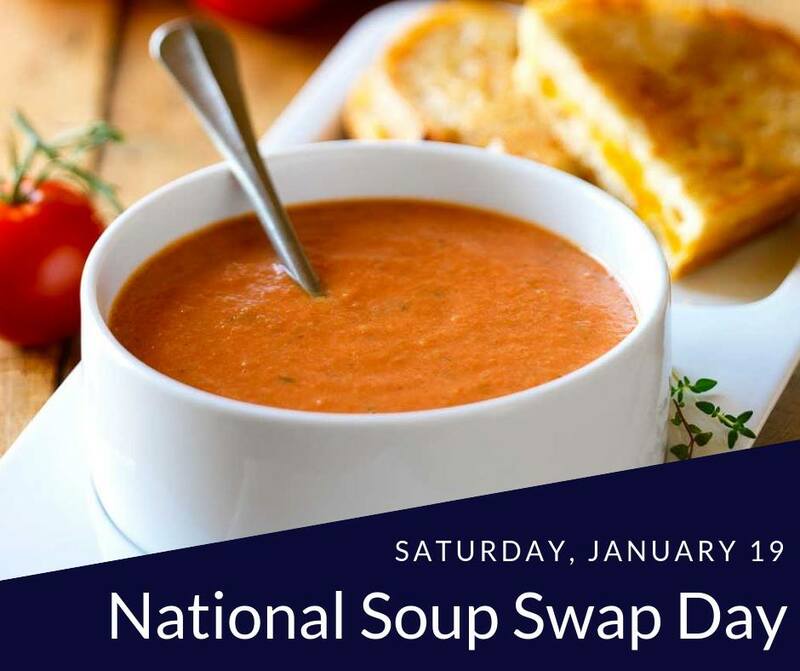 Thanks for sharing on the Celebrate 365 Soup Swap! There's a german restaurant that makes this soup too and I love it, but I bet yours is way better hehe! Homemade is always best!! This German girl can't wait to try this! Something about goulash has always made me nervous, but this is so amazing. I don't know what scared me so much! I love The German Cookbook! I have made many recipes from it and i now will make this one too! Such a hearty and flavorful soup! This sounds amazing, I've got some caraway in the cabinet that I bought for a recipe and have been looking for other ways to use it! Looks delicious Amy! Have never had this dish, but yours sure makes it very tempting. Thanks! Hearty and flavorful, just what I want at this time of the year. Yours looks beautiful! And really, really good. Thanks! 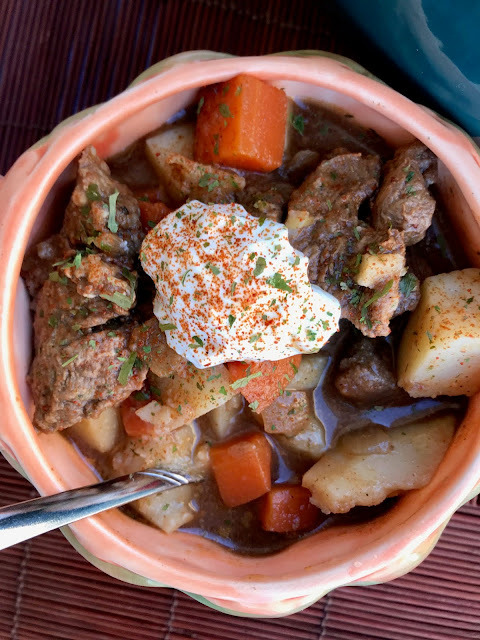 Your goulash looks delicious...a truly comfort food...specially in this cold weather. I hope you are having a wonderful week Amy!